This is the time of year where we start longing for Spring to come, especially here in Alberta, Canada where the snow is still up to our knees. Our kids do love the snow and all of the fun that comes with it (and I mostly enjoy its beauty), but we’re definitely ready for milder temperatures so that we can play outside more (cabin fever, anyone?). In faith that Spring will indeed come soon, I’ve decorated our mantel with fresh and faux florals and greenery. It’s instantly brightened up our living room, and the sight of blooms makes me hopeful that Spring is just around the corner. 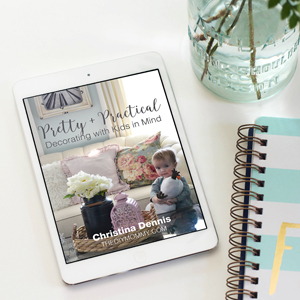 Come take a mini tour of our fresh, floral Spring mantel decor, and make sure to visit the bottom of this blog post to see several more beautiful Spring mantel decor ideas from my blogging friends! 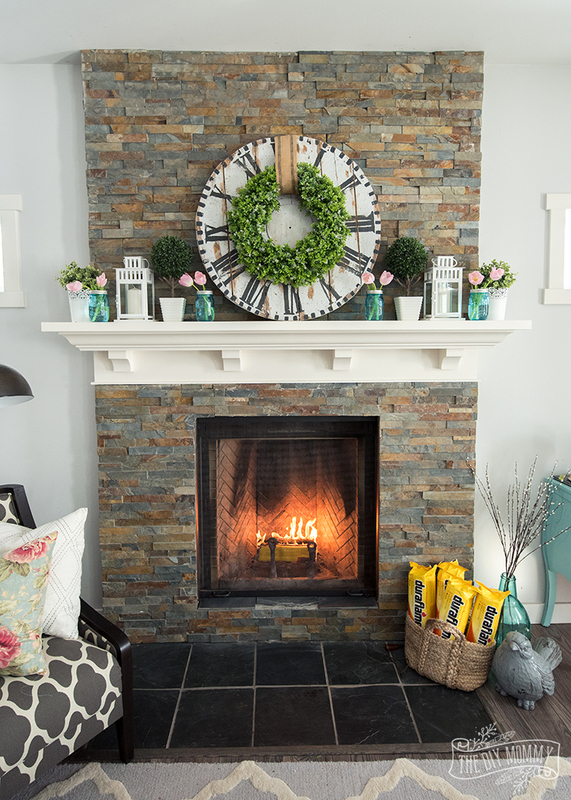 For our mantel decor this season, I’ve kept my beloved DIY wooden clock as the main focal point in the center. To make it more Springy, I simply took off the clock hands (I’ve only been using the clock decoratively anyhow), and hung a faux boxwood wreath over it with some rustic webbing. Simple white lanterns on either side of the clock look outdoors-y and bright for Spring, while two faux boxwood plants in white containers on either end of the mantel anchor the look. 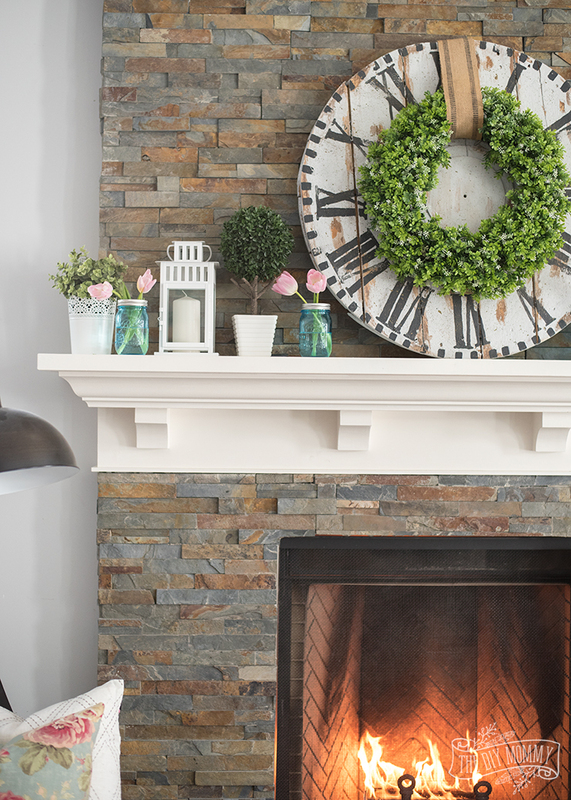 TIP: Decorating your mantel with a triangle shape in mind will always make it look great! 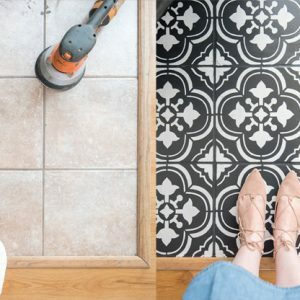 Use a large piece in the middle, two smaller items on each side, and fill in the spaces between with items that go from larger in the center to smaller on the outside. I know they’re probably a little passe now, but I couldn’t help but add in my dear old blue mason jars with fresh pink tulips to the decor. Don’t they look so happy here? 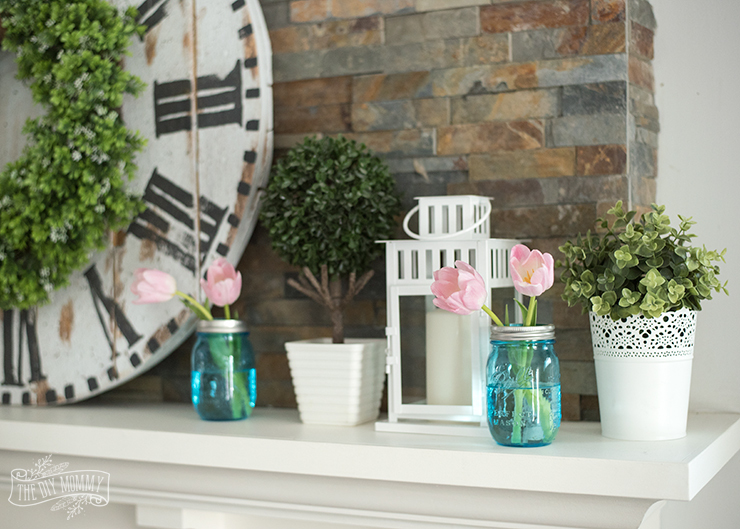 TIP: You could also use fake tulips instead – just keep water in the mason jars to give them more of a realistic look. 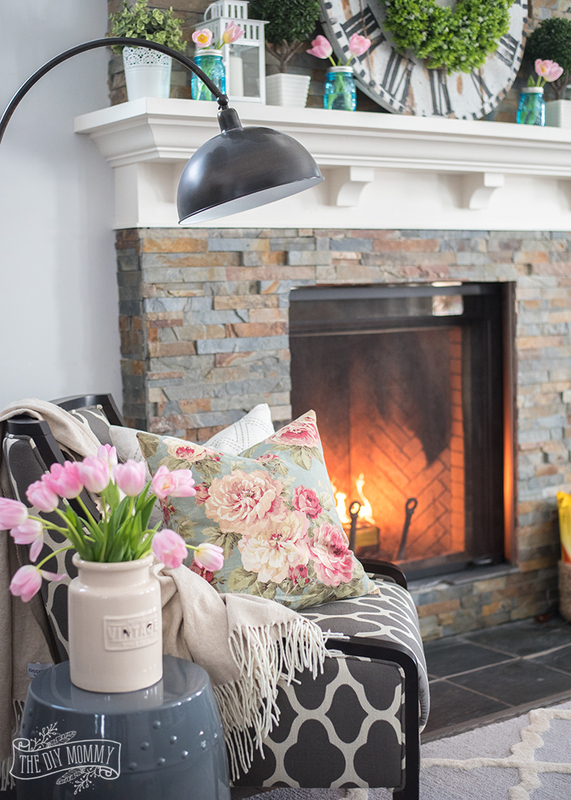 A vase of beautiful and wild looking tulips by a reading chair topped with a DIY floral pillow adds to this fresh, floral fireside look (say THAT ten times fast!). Since it’s still cold here (BOO! ), I’ve continued to enjoy using Duraflame firelogs in our fireplace to make our living room instantly cozy. In about 3 seconds, I can have a beautiful fire roaring in our fireplace that’s both warm and safe (Duraflame firelogs burn 80% cleaner than a typical wood fire) for me an my kids. 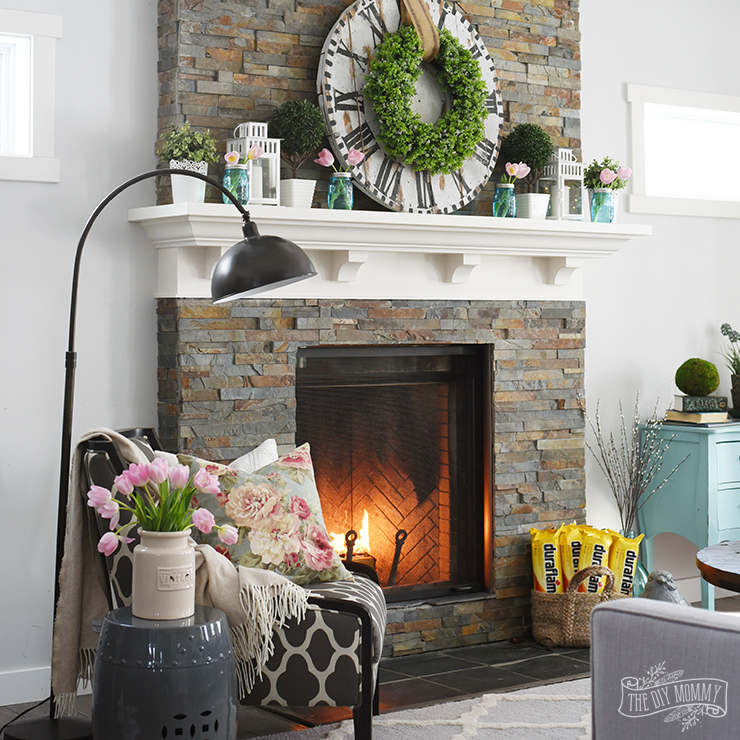 My fresh, floral mantel is all ready for the new season… now we just need the warmer weather. We’re ready for you, Spring! Disclaimer: This post is sponsored by Duraflame. As always, all of the opinions here are my own. This post also contains affiliate links. 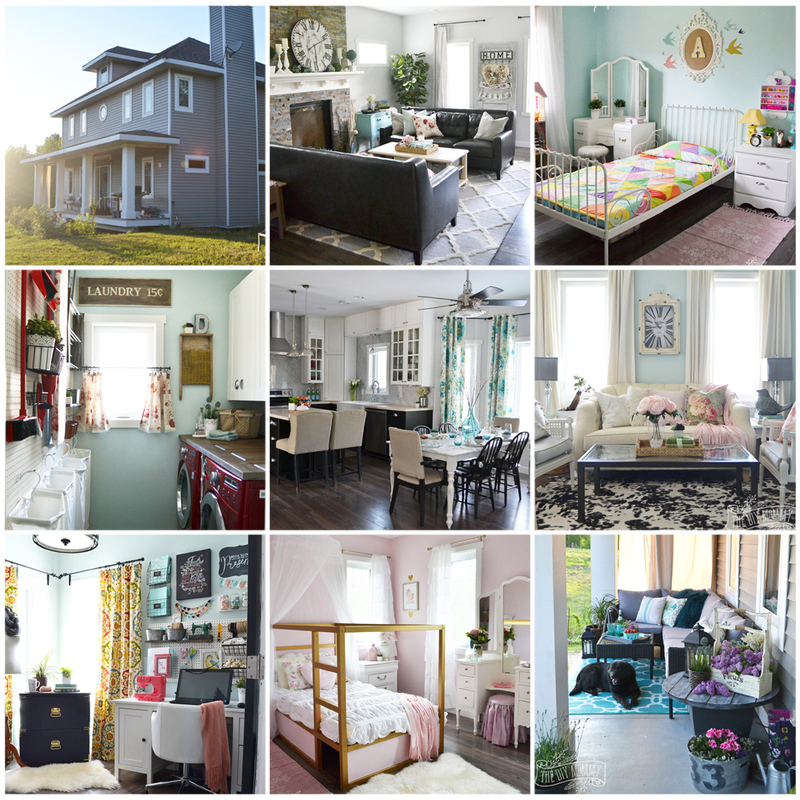 Love the pink and turquoise touches. So perfect and pretty for spring! It’s so beautiful! Thank you for joining in the hop this spring. Your pinks and blues are so perfect for the season! You mantel is beautiful. I love that DIY clock and that floral pillow! Pinning! The blue mason jars with the pink tulips are my favorite! Such a gorgeous mantel, Christina. I love that boxwood wreath on top of your clock. That fireplace sure looks cozy! 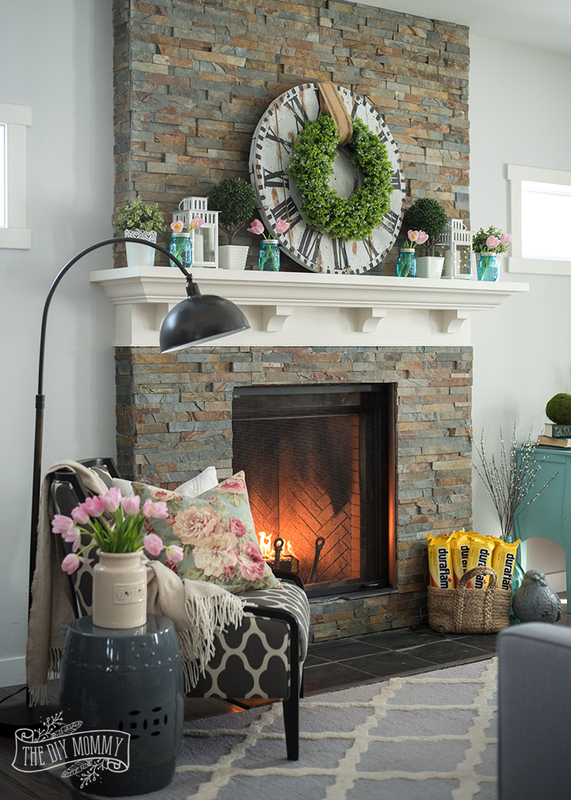 your fireplace is gorgeous on it’s own but i love the pop of the teal & pink! 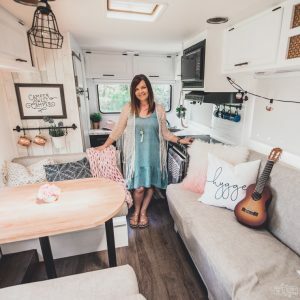 I always love your decor, Christina! This is no exception. It’s gorgeous! You’re too sweet, Iris. Thank you!! Fingers crossed the snow starts melting, sooner than later. 🙂 Thank you, Sarah for the sweet comments. I just love every bit of your mantel! Love the wreath over the clock! I love the delicate and feminine touches with the flowers! Your fireplace is stunning in and of itself and I just love how you have it decorated! The mason jars with tulips are my favorite touch! Pinning! Thank you, Michelle so the sweet comment:) The Duraflame logs really are a life saver! 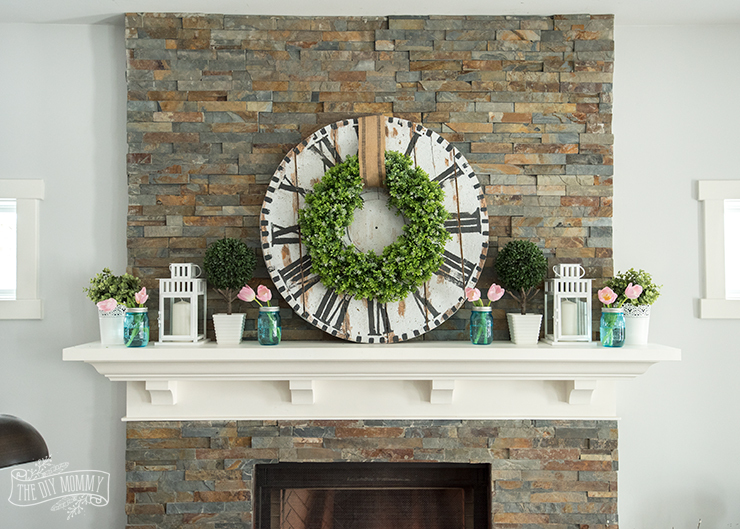 I love how you added the boxwood wreath over the clock, and how you incorporated so many soft colors! It is really beautiful and inviting! Oh my goodness! I love your Spring Mantel. The wreath layered over the large clock and pink tulips are perfect. Thanks so much for the DIY inspiration! Thank you, Ashley!! The tulips are that perfect little pop of colour. So happy you think so too! 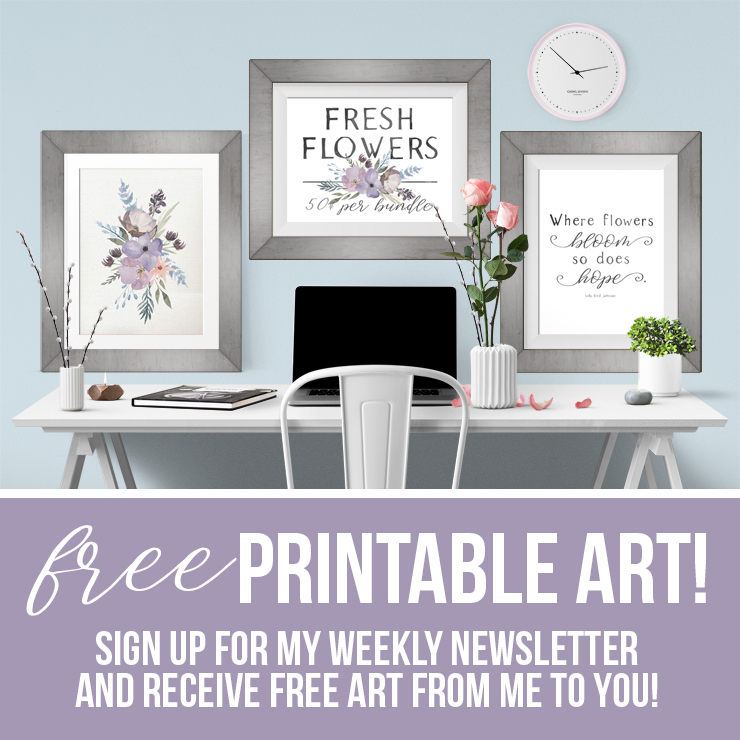 Love the pretty spring color scheme and the fresh florals! That clock is amazing! It gives me all the heart eyes. 🙂 Love it! I love all the fresh spring colors. I can see that it has brightened up your whole room! Gorgeous mantel! I love the boxwood wreath on the clock and those aqua Mason jars! Love your spring mantel, and the rest of your spring decor that I saw today! It’s even nicer in person than in the photos!